Today’s card is bright and cheerful – perfect as we just had some beautiful weather here in North Georgia and the early daffodils are starting to peak their heads out of the ground. However, today we’re back a normal winter day. 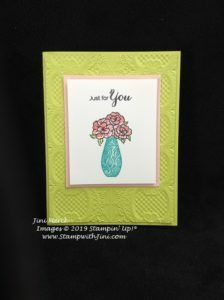 Today’s card is my February Thank You card that I created to send out to all of my stamping friends who place an order with me. 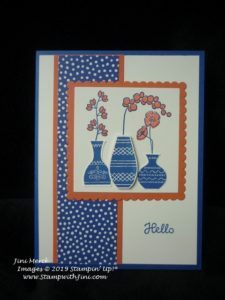 The two step stamp set, Vibrant Vases is easy to use and because of the bold images you won’t have a problem lining things up when stamping. It’s also perfect for the Stamparatus if you prefer to go that way. 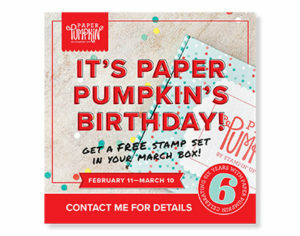 And did you know that this stamp set coordinates with the Vase Builder Punch (147040) found in the Annual Catalog? That makes it a great way to make this punch even more versatile. I’ve put together a quick video tutorial for you along with a PDF. And here is the PDF for you with a complete supply list and step by step directions.